This Christmas, Europe was covered in snow. For most, that meant less cycling. 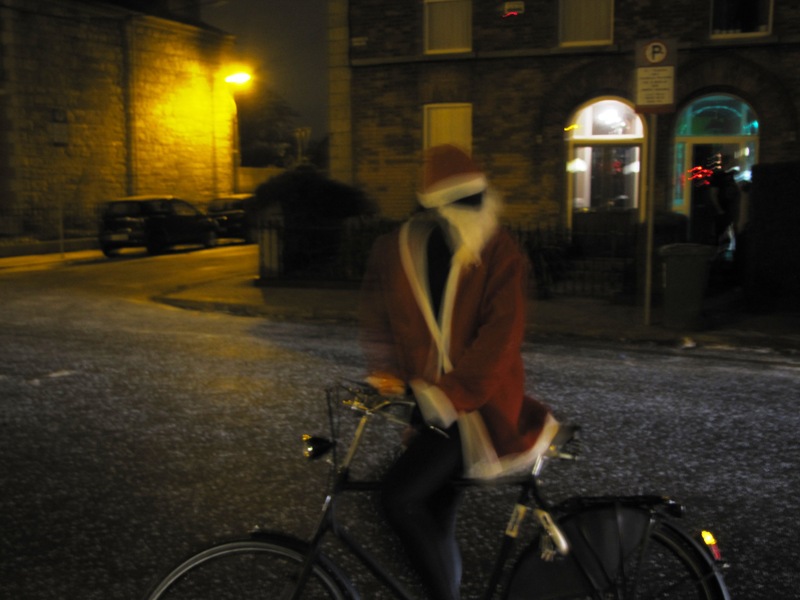 Some Cycling Santa’s, however, kept on riding. 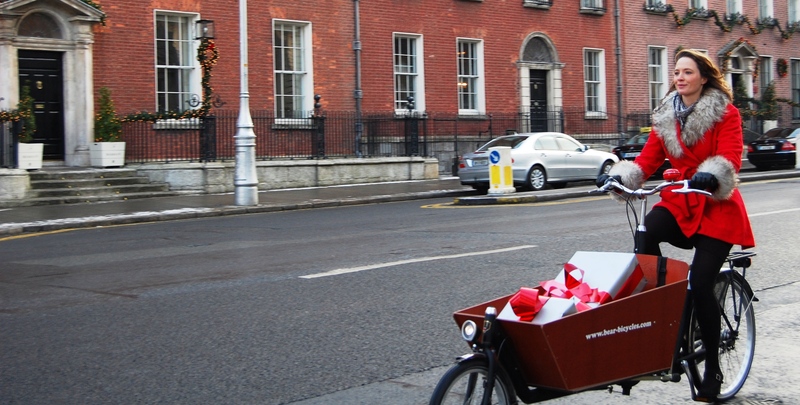 Fashion stylist Aisling Farinella rides a ladies’ bike with a red frame and a whicker basket. She has a special relationship with her bike. However, that relationship did not develop overnight. Her previous bike was a yellow bmx, and it was Aisling’s perfect fit (Aisling isn’t very tall, and neither are bmx bikes). So when the bmx was stolen, Aisling was heart-broken and she decided to quit biking. For a year, she walked instead. In the end, it was with help of her friend, Fiona Mullen, that Aisling got back to biking. A friend of Fiona’s had moved back to Australia, but had left her red bike in a Temple Bar repair shop. For a year it sat there – until Aisling was talking about getting another bike and Fiona remembered the red bike. After having described the bike to the shop owner, it took him two days to drag it out, but when he did, it was love at first sight. And with that, Aisling was back on a bike; a red one instead of a yellow one. Now, she can hardly imagine having lived without it. Aisling lives three minutes from her studio on New Row South, but even for that short distance she’ll ride her bike. The photographers, architects and graphic designers she shares the studio with will know Aisling is at work when her red bike is parked in the studio’s bike room. In recent days, while Aisling was preparing the launch of Eilis Boyles 10th collection fashion showcase, the red bike would be waiting when others started arriving at the studio. Aisling likes to start work early. Apart from starting early, Aisling’s days are unpredictable. Her whole career has been unpredictable. She holds a Masters in Cinema, but while working as a production assistant, she met photographer Gordon Goodwin and was sparked by his distinctive approach to fashion. It inspired her to become a fashion stylist. 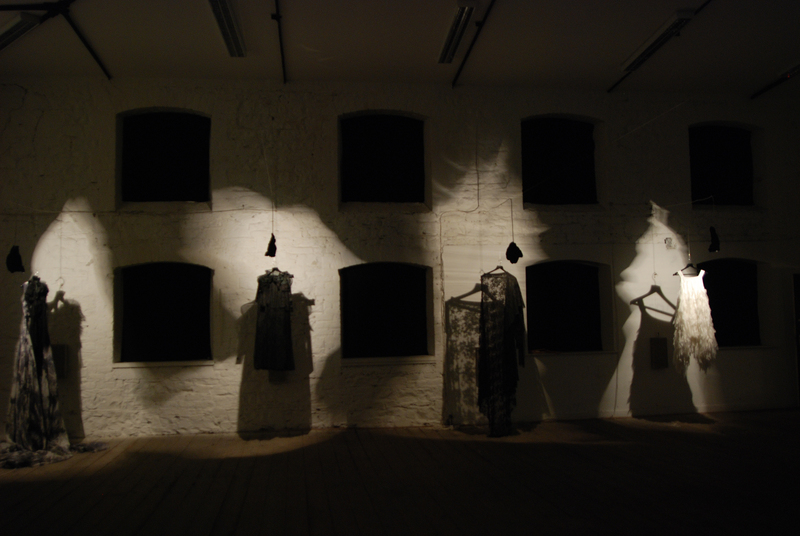 The recent Eilis Boyle installation at her studio, with its delicate lace against dark backgrounds, shows Aisling has incorporated a distinctive approach into her own unconventional style as well. It’s that unconventional style that gives Aisling a diverse group of clients; she works for small fashion boutiques, but also for Dunnes Stores – where she styles the Savida brand. Her love for cycling has also surfaced in her professional work. 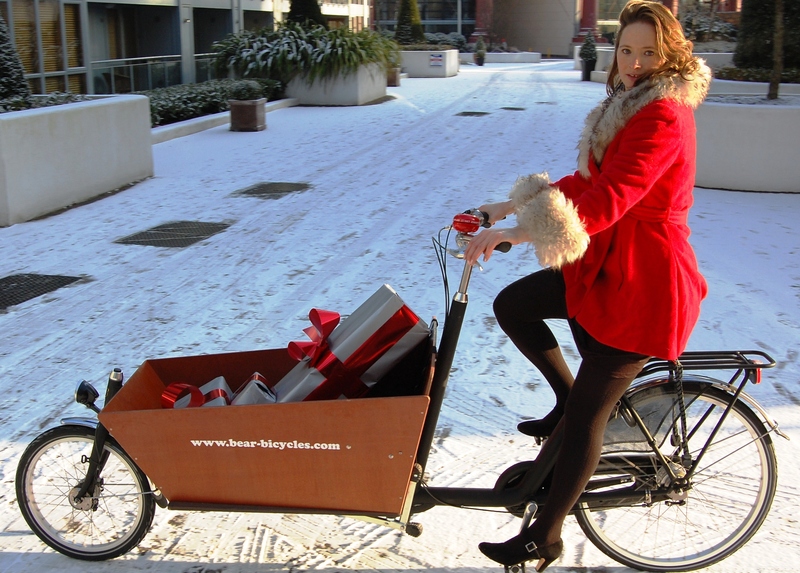 When the Dublin bikes scheme launched in September 2009, Aisling styled an Irish Times special cycle edition. 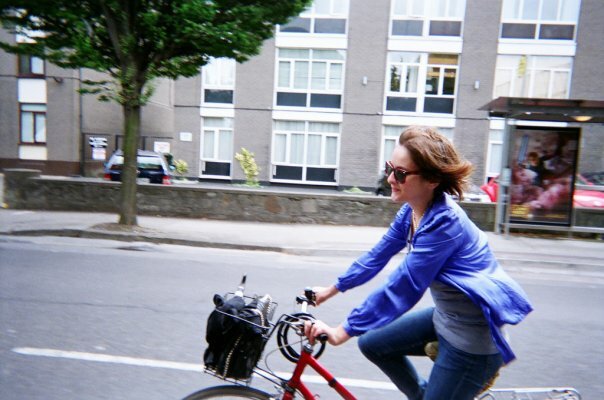 She sought out all sorts of Dubliners, all sorts of bikes, and all sorts of styles to show how universal cycling is. The Irish Times special edition is well worth a read. 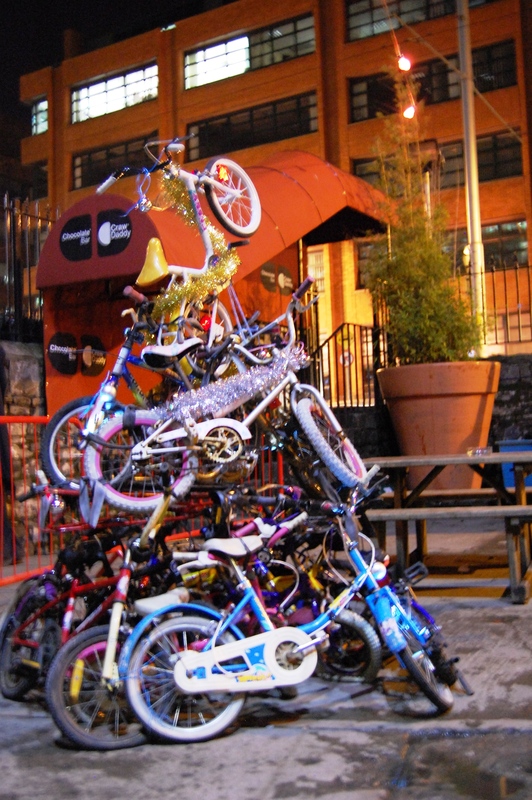 But in the end, Aisling herself is the best tribute to cycling in Dublin. Even though her job makes it unavoidable to occasionally travel by car (to transport railings and clothes), she’ll do anything to rather ride her red bike. Of course, the fact that she drives a drab, silver gray Opel Astra has something to do with it as well. The Dublin Cycling Campaign is not only there for your cycle friendly city. Last Thursday shows it also provides community service by organising great parties. 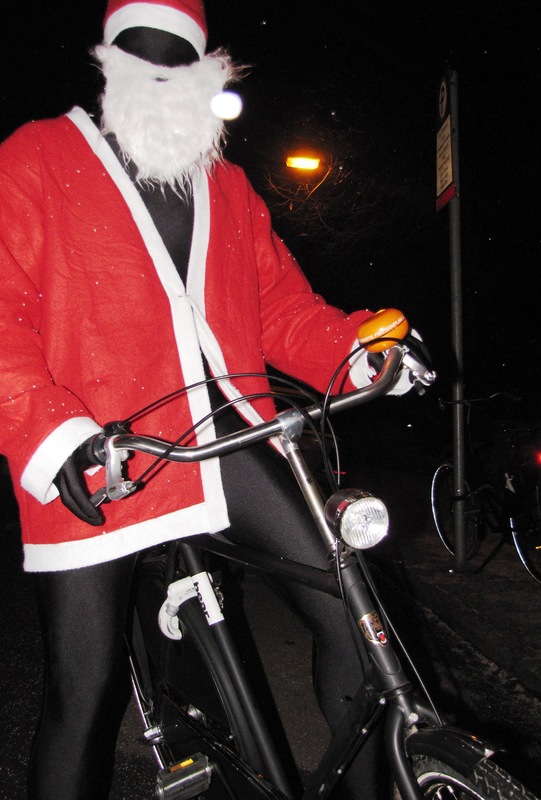 The annual Christmas Party at the Pod was filled with bicycle commuters, cycle chic party goers, and jolly couriers. The sidewalks and traffic squares on Harcourt street were temporarily transformed into Dublin’s busiest bike parking spot; fixies were strung up high in racks and railings, road racers were bundled together as if to warm each other in the snow, and Dutch bicycles stood locked against the LUAS lantern posts. Outside, the Bicycle Christmas Tree welcomed visitors, while inside, people already warmed up to a fashion display by local Dublin businesses Georgia in Dublin, GreenAer, Rothar, Urban Frog, and bear bicycles. Their five minute fashion show – involving unique rain gear, electric bikes, panther print panniers, merino wool and Dutch cheese – kick started the party, paving the way for Dublin Goldsprints and their bike battles. The Goldsprints´ many blue bike versus red bike moments led to a final, after which the DJ took over with music and bike films. The rest is bike history. 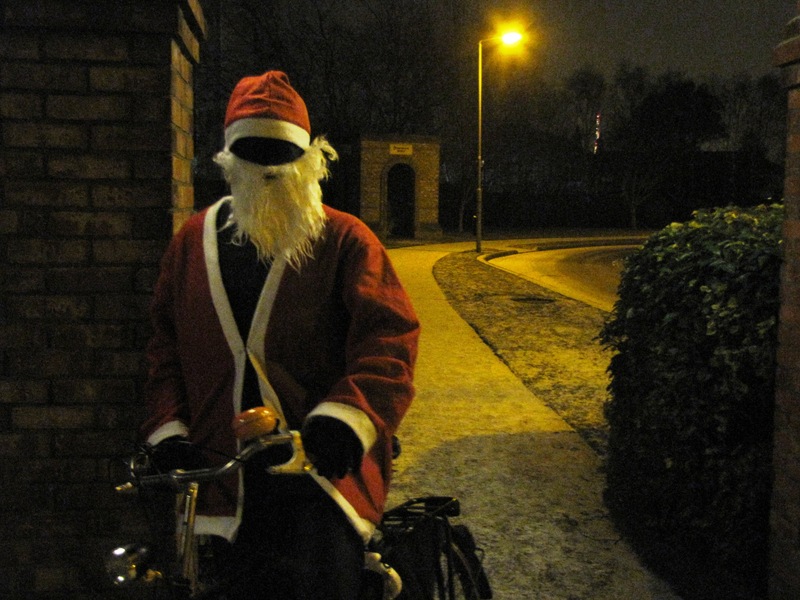 Tomorrow, the Dublin Cycling Campaign hosts its annual Christmas Party (8:30 pm, The Pod, Harcourt Street). 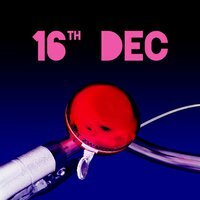 Like previous year, bicycle lovers will have plenty to look at: bicycle Christmas trees, bicycles films, and bicycle battles (next week, this blog will bring you a report of the party itself). 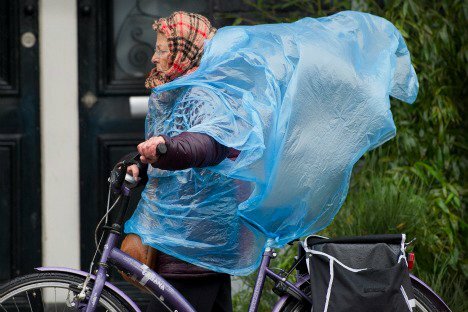 This year, however, the Dublin Cycling Campaign also introduces a new element: fashion. 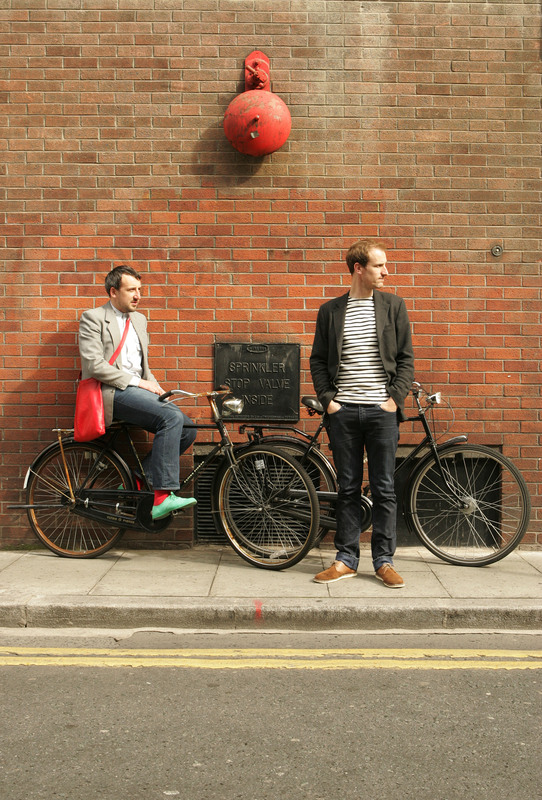 In a Bicycle Fashion Show, Dublin designers will be sending out models to show their costumes and bicycles. Fashion and cycling go hand in hand these days. 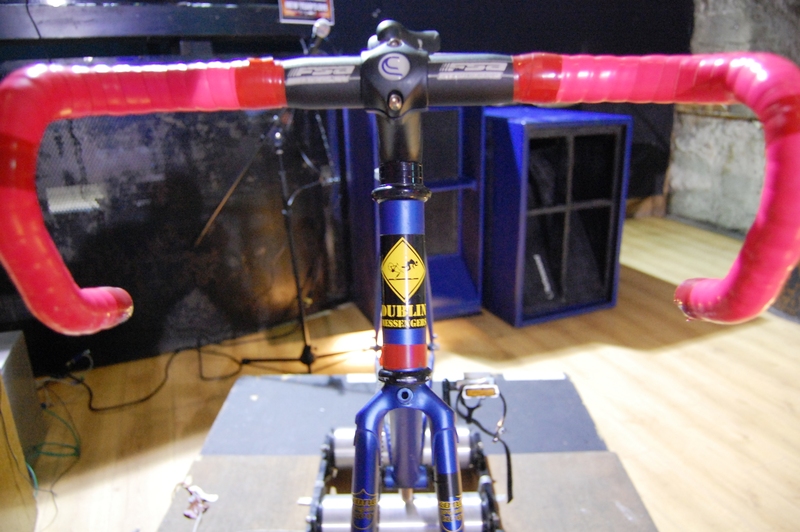 Bicycles are found in shop windows and glossy magazines. Models with tilted heads and meaningful stares, leaning against sleek bike frames, decorate the city’s billboards. So a fashion show dedicated solely to cycling is the natural next step to educate people cycling should be done in style. This is the Netherlands: where cycling is purely functional and style isn’t on a cyclist’s mind. 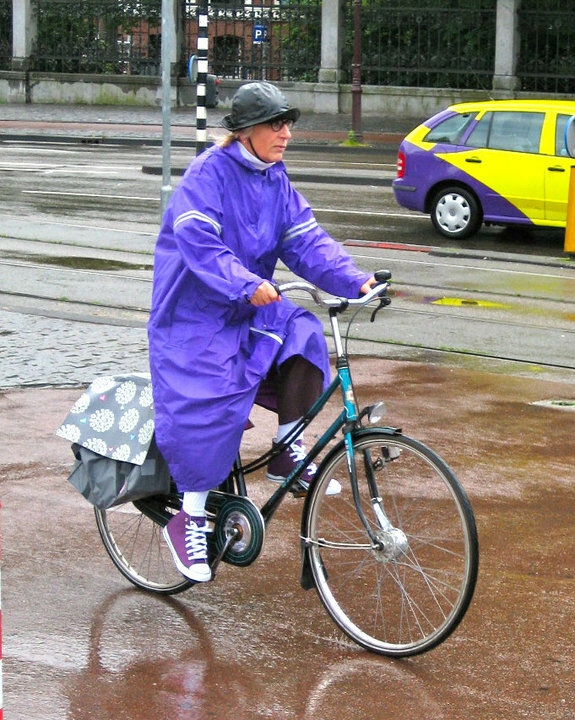 Because more and more, the non-Dutch focus on cycling in style is also surfacing in the Netherlands. For example: three Amsterdam ladies recently set out on a mission to bring style to Dutch cycling. Inspired by 18th century Victorian couture, their company Madame De Pé produces stylish raincoats that make flapping poncho’s belong to the past. 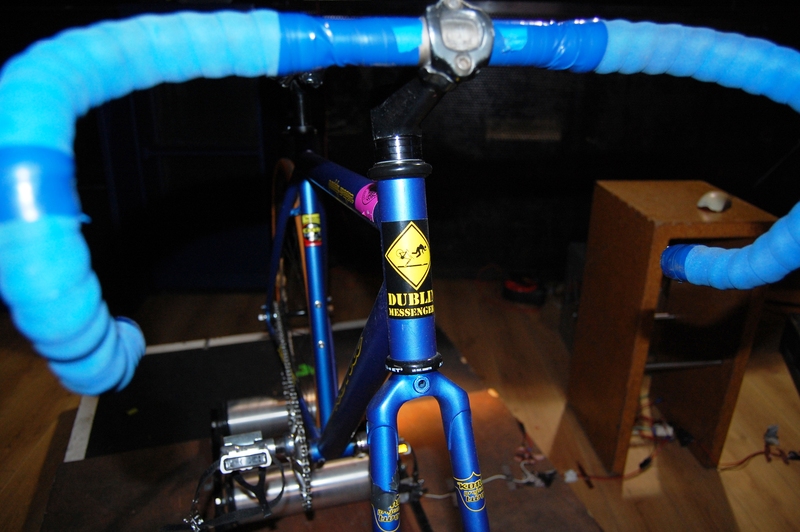 And there’s more: fancy fixies and bmx bikes are other examples of foreign influences on Dutch cycling. So tomorrow, at the Dublin Cycling Campaign’s Fashion Show, we’ll be extra alert. Maybe we’ll find some Dublin fashion that suits the Dutch. 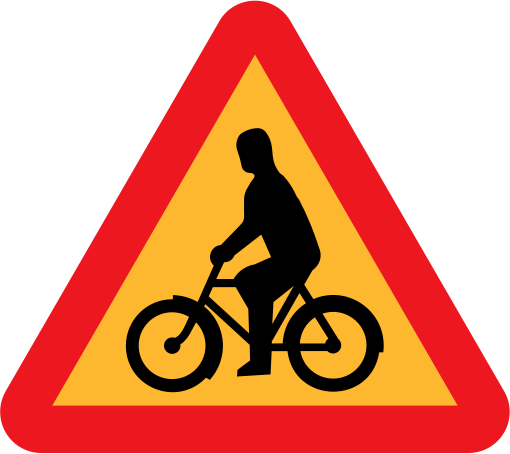 Judging by this Swedish traffic sign (designed by the Swedish Transport Administration (Transportstyrelsen)), Swedish cyclists are a lot sturdier than their Belgian and Hungarian counterparts. The Swedish silhouette – with its rectangular head and massive torso – dwarfs the bike it rides. It has made me wonder who acted as model for this sign. 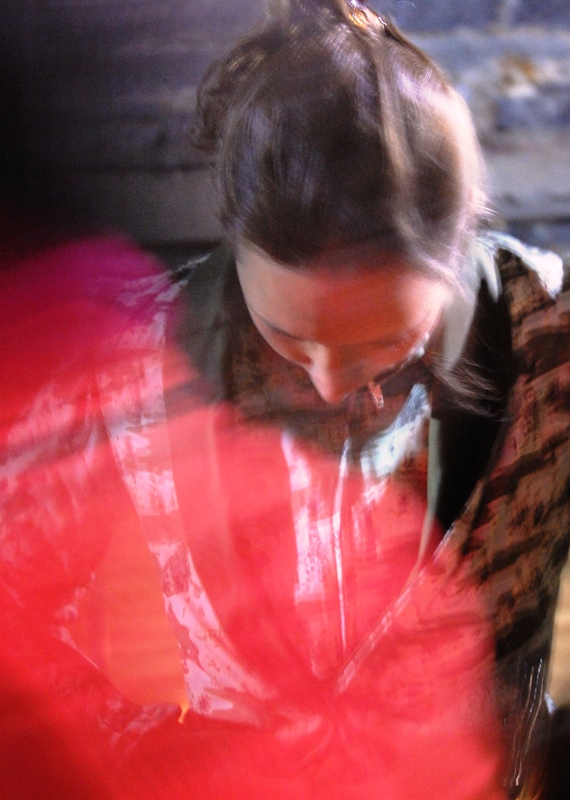 Most likely, the model is wearing many layers of clothes – necessary to bear the Swedish cold. The model’s hat, sweaters, and coat give the silhouette a bulky appearance. That appearance is deceiving though, because the actual cyclist underneath those layers could be anybody; a bearded lumberjack or a tall blonde. 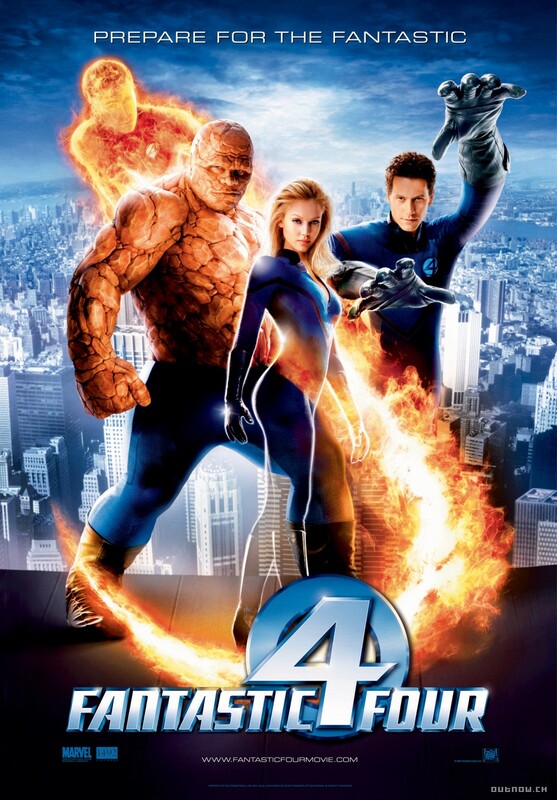 The other explanation is the Swedish sign is modeled after the Rock Man (from the Fantastic 4 – depicted below). That seems less likely. On the other hand: Rock Man’s weight would help explain why the bike in the traffic sign has such oversize frame tubes. In the Netherlands, Japanese tourists are warmly welcomed — they are probably our favourite visitors. The thousands of Japanese visiting the Netherlands each year bring in good business and have a flattering appreciation of Dutch culture. Their interest in flowers and windmills has even resulted in a Dutch theme park being built in Japan. Huis ten Bosch (named after the Dutch royal palace in The Hague) lies on Hario Island, and features canals, amusement rides and a park planted in seasonal flowers. 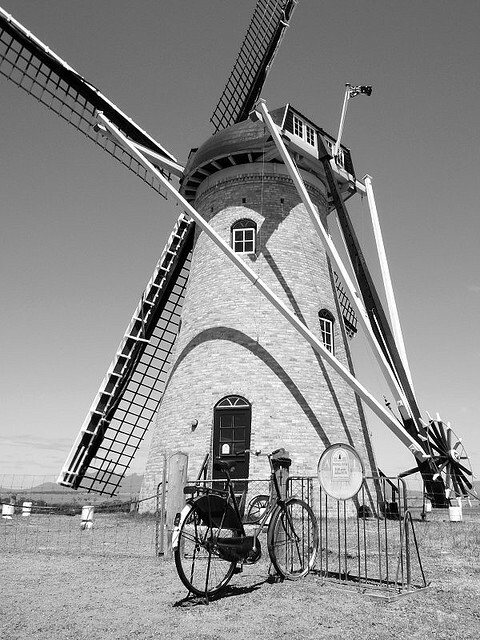 However, Japanese not only take interest in our windmills and flowers. Dutch bicycles are also popular. Cycling through Amsterdam, I often see Japanese tourists taking pictures of typical Amsterdam bicycle rental shops. In the past, such a sight always made me wonder: how long will it take before the Japanese take home this aspect of Dutch Culture, just like they did with Huis ten Bosch? It turns out I was being ethnocentric. From my recent contacts with Japanese bicycle specialist Shuichi, I learned cycling has been part of Japanese culture all along. 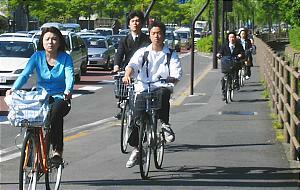 As in the Netherlands, Japanese cycling culture focuses on functionality. Every day, the Japanese ride their bikes to get to work or to bring kids to school, and they do it their every day clothes. 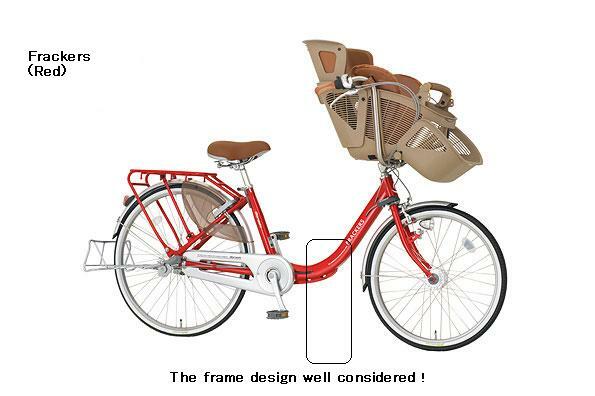 The bicycle is also a part of Japanese family life; special Mama Bicycles, with V shaped steering wheels that fit foldable child seats, are becoming more popular. 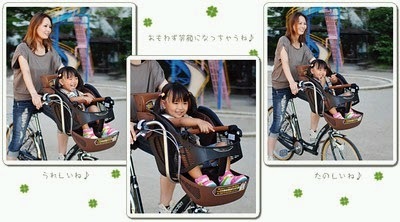 I warmly recommend a visit to Shuichi’s Mama Bicycle blog; it gives a great idea of cycling in Japan. 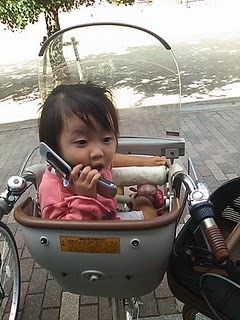 And Shuichi or his daughter (in the picture) are happy to tell you more.